I hope you take your own advice this game. I think I got the wrong room. Some of you guys are alright, Don’t go to room nr 2 tomorrow. Why do you want a vote on lawliet?? At that moment in time he would have been guaranteed a lynch, if emziek didn't unvote. @Emziek, your reason for unvoting?? Just checked how you play round 1 in the previous games. 2/3 times you were a villager. You'd write an essay with 5 paragraphs, 100 words long each.. just kidding I mean you put some effort in your R1 posts every time you were a villager.. The one time you were a mafia your post was the kind of "hey I'm here participating in the game, voting and not AFKing"..
guess I can see a pattern here. I'm slightly suspicious about both Ish and Ultor. I get some mafia reads from some of what Ish was writing earlier in the thread. I also find it curious how Ultor got nothing to say about Ish and SiX, comparing to how he observed and commented on most stuff last game, something feels of. I get it he might just busy with real life as he says himself, but real life is also a convenient excuse to avoid having to move into the spotlight. I've definitely figured out some of the mafia. Will provide you with my analysis next round. Oh yeah? I'm looking forward to that analysis. Here I wonder why you can't share it already? I'm not terribly sure about this wagon on crisp0. Finger of suspicion on SiX, just a gut feeling. And I'm not terribly sure about this wagon on Ultor either. Finger of suspicion on HATER for placing his vote on Ultor rather than on crisp0, who was bound to flip innocent, so he could have a motive to point fingers at others. You've yet to explain your reason for keeping your vote on Crisp0 even after you being out of danger. SiX you reek of anti-town this game. Me being shot somewhat clears Ultor from my suspicion, not entirely but to me it seems like a move the mafia would do to paint Ultor as a bad guy. I could be wrong on this one. Ish is still very suspicious, I think hes acting confused about the deaths solely to seem like a clueless villager - not something Ish would do normally, he would be on point. There's 2 simple answers for this. (1) Someone had to be lynched, not necessarily Crisp0, but someone. And that someone happened to be CrisP0 whom I kept my vote on. (2) The round ends far after I've gone to bed. The host's timezone is UTC -4, mine is UTC +3, meaning the round ends about 7 in the morning for me. Basically about 5 hours before I went offline. (1) True enough but the round was extended a full extra 24 hours and you had plenty of time to withdraw your vote and start investigating someone else or keep trying to investigate CrisP0. Instead you kept your vote, on a bandwagon, which held no reason behind it anymore. This is anti-town. (2)The following happened more than 24 hours before the round end. Six does not seem so suspicious by how he posts, lets check out as the game goes further. It would seem your argument holds no grounds. I'm the Journalist (Village peeker) R0: Lawliet (not suspicious), R1: Ish (suspicious). Lawliet: I never actually contacted Lawliet because I wanted to observe his plays first, as such I random voted him R1 but later caught up on his observation on Ultor which I agreed with at the time. I was going to claim to him this round depending on his reaction to the R1 end alas he died. Ish: I decided to peek Ish because something felt off with his posts R1, I pointed this out in my posts during R1 as well. Lien is always inactive, except when shes mafia. (1) Are you sure that Lawliet didn't convince you to unvote him by poking you @steam? Could this mean that you are the Serial Killer? The second thing to come to mind is that while you may not want to start bandwagons, you gladly join one? That's typical scum (or SK in this case) play. 1/13 chance of him being the Godfather, Yeah I'm going to send him a PM through the website asking to be killed. Instead of doing my own research first. Also I'm not asking anyone to claim to me, I couldn't careless. We're 1 round away from losing this and we need to kill a mafia Now. Please respond to your PM. I've already taken screenshots just so u know. 1/13 chance of him being the Godfather, Yeah I'm going to send him a PM through the website asking to be killed. You wanted to poke him regardless, be it the PMs or on Steam. Either way, as a Journalist, I believed you'd have taken that risk. You could also have waited until he logged in on your steam chat. To vote him, with there being a 12 / 13 chance of him being Town, makes no sense. That VOTE makes no sense. Go through my friendlist, I don't even have Lawliet on my friendlist. The poke means nothing SiX, infact no PMs were exchanged between me and Lawliet at all. @Ultor: Resend the PM, there is nothing in my inbox. I was claiming Journalist to you. Later when I decided to make it publicly I figured I would delete my pm. Where do I come into the picture? I have definite evidence of you being a mafia which I will reveal next round! I'm also providing this evidence with a trust-worthy villager in case I die, along with every chat log I have with every person. You're delaying it until next round - the round the village will no longer be in a majority posistion. Good on you for being open about your evidence. If you had any evidence you would've posted it already. As it stands I'm undisputed Journalist claim, you've nothing on me. Post the "evidence" so I can defend myself or you should really reconsider your read on me. The SK has no reason to target any other room except mine. If my Journalist claim is correct, hes taking out a PR, although if any of my SK reads are correct it will give them legitimacy. There is no way, unless the HM moves me, that I'm getting out of this round alive. I'm still looking for any HM/Journalist counter-claims, would be extremely helpful for the village. Do note that Ultor is by no means a confirmed village. Ultor is still on the point that Emziek is mafia and that after Emziek revealed his role and no one else claimed to be the Journalist...so in my opinion Emziek is more proven to be the Journalist then Ultor claiming to be HM, what also can be but this claiming is also not 100% like he said it on Emziek. . If you believe my Journalist claim there is NO REASON not to vote Ish. He has been peeked suspicious, he is the only safe bet to keep the village alive and going. let me think he is a non villager and maybe work together with SiX in a (mafia) Team. I doubt it. I'm certain one of SiX and Ultor is a villager and the other one is the SK. Although anything could be possible. It's extremely unlikely SiX is in the mafia team together with Ish, if they're, they've done hell of a good job making it seem like they're playing for different teams. It's extremely unlikely SiX is in the mafia team together with Ish, if they're, they've done hell of a good job making it seem like they're playing for different teams. Scratch this, starting to second guess this read. I think there is a possibility they set up their posts early in the thread to distance their relationship between each other. The posts bellow does suggest that they may infact have a relationship. We should vote for someone conclusively, otherwise SiX is the one getting lynched because of LHLV, i put forward Crisp0 as he hasn't responded to the thread yet, just his In post. I'd rather vote an afk than someone contributing to the game. NOTICE how SiX doesn't refute him here like in R1. In regards to your alignment, I've mixed feelings. I want to vote for you, but I also don't want to. I feel like I owe this post a proper response. I was rather confused earlier about SiX being so caught up on the "POKE" word and it took me multiple posts to actually get where he was coming from. To vote him, with there being a 12 / 13 chance of him being Town, makes no sense. That VOTE makes no sense. My bad, there was a 1/10 chance of him being the godfather, not 1/13. I'm not gonna risk that 10% to get killed the first round. Not when I had multiple suspects I wanted to investigate first, one which got peeked suspicious. I never actually contacted Lawliet because I wanted to observe his plays first, as such I random voted him R1 but later caught up on his observation on Ultor which I agreed with at the time. I wanted to see how he would respond to my vote, would he revenge vote me? Contact me himself? He did neither. I never had any intention of actually getting him lynch hence my sudden unvote when Ultor revenge voted him. Besides why does it even matter if Lawliet contacted me after that vote or not? It doesn't. You were grasping at any straws you could find, SiX, to paint me non-town and discredit my PR claim. Ultor has been peeked not suspicous. This clears him from the possibility of being the sk but he could still be the gf. I have a vigilante claim, please contact me with any counter claims. @ultor: Did SiX tell anyone else, to your knowledge, which room he was staying in? Also IF YOU ARE THE VIGILANTE AND HAVEN'T CLAIMED TO ME, PLEASE DO SO. I ALREADY HAVE A CLAIM FROM A SUPPOSED VIGILANTE. If we do the maths, Ultor only has a 20% chance of being evil while everyone else is sitting at 50%. Do note that I don't include myself in the calculations as I'm 99% confirmed. I've been Shot, I've an uncontested Journalist claim and I've lynched a mafia. Only 2 game related posts that contribute next to nothing. Get active and start posting. @Emziek i dont get your calculation style why Ultor is like 20% being evil and all others on 50%. Can you explain that pls? Still waiting for a Veteran counter-claim. Please PM if you're the real Veteran. @Emziek another note, since SiX (villager) had such a hard fight with HATER i would advice you to peek him next round or me. Very little chance I will survive - The only scenario I survive this round is if we get lucky, take out the sniper AND the SK/Mafia doesn't randomly attack my current room. I have yet to decide what room I will peek. You've failed to convince me Konijn. It could be your lack of sleep talking but some of your reads seems off. You're pointing fingers Ultor where its not due while you're patting Leo for being Pro-village when you yourself said it you cba reading everyones posts. -- Seems to think at start of the game I have a high chance of being village due to being "stabbed by both parties" - a dangerous thing for mafia to instill village trust in a villager perhaps? WIFOM argument and not necessarily a pro-village move. Irrelevant when Ultor can't possibly be the SK. You're just pointing fingers. Says this when he also admits he doesn't have the energy to read through all the posts. And im not dumb at all i have many secretly in my mind as for Programma, Lien, HATER and Panda (very low posting, best way to hide as mafia)...Only on one I believe in my "gut feeling" on Konijn that he is innocent and trust me or trust me not, i don't know why i just have that feeling on him. NOTE: Konijn had made 2 game related post at this point, didn't vote in R1 and only joined the BW on confirmed mafia very late into the round. Nothing Konijn had made by this point was pro-village. Well i dont trust you blind, because you can be on different thoughts wrong too...but i said i follow you so i will put my vote on the silent guys...in that i believe at the beginning that there are some hiding mafias. Nothing wrong here in normal cases, infact I would applaud Leo, but with everything else surrounding Konijn and Leo I think there may be a connection here. I have 1 Veteran claim. If you're the real VETERAN and haven't claimed to me make SURE you counter-claim to me SOON. I'm 99% confirmed Journalist(Village peeker). 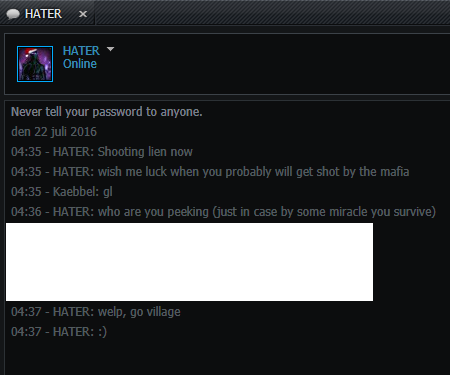 HATER is likely the SK. (See: Ultors screenshots+chatlogs) Veteran is probably going to shot him, we haven't decided yet. Anyone who is inactive start posting NOW so we can sort the mafia out. @Emziek: Well you wanted my opinions so I gave them, I never said they are accurate, just how I felt based on the previous round's actions. I didn't read most of Leo's posts because they're extremely lengthy and by the time I had gotten to him I had already spent a good hour or so reading + writing analyses. I skimmed over his posts, hence why I said they seem pro village and added that I didn't read them properly. You say I'm pointing fingers at Ultor when it's not due, can you explain why it's not due? I listed the things that he did which I believe are anti-village and instead of making counter-points to those you simply dismissed it out of hand. Also, why can't Ultor be the SK? Read the chatlogs between Ultor and SiX. As for the last question, the only possible evil role Ultor can have is godfather as he has been peeked not suspicous. But i can't say for real for which team he plays, he posted not enough. What i don't get is why you all put fingers on all who are active in the game while some smart guys hide as mafia with no real posting to get not seen as mafia or to not be readable. Leo you contradict yourself within 2 sentences after one another. I peeked room 10 (Leos room) and I only found Liens corpse. Leo what room are you in right now? This doesn't apply to Ultor and HATER as I already know your room numbers from our chats. I'm confused. Are you against taking screenshots of chats or simply angry at Ultor for asking you to quote the host? If the first then what is really aggravating about this post? HATER is the Veteran claim I have. - If Lien flips villager or SK, HATER could still be either villager or Mafia. I sent it as a failsafe incase HATER was the SK. (I had plently of reasons to believe HATER was the SK) Sending the pm out to all players in itself was a huge risk which paid of.